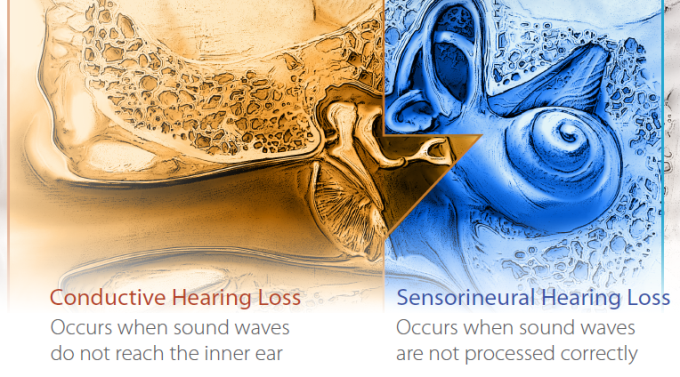 When both conductive hearing loss and sensorineural hearing loss are present in one or both ears, it is referred to as mixed hearing loss. In this case, there is likely to be damage to the outer or middle ear as well as to the inner ear or auditory nerve. As with conductive hearing loss, an ear infection or malformation of the middle or outer ear may play a role, along with some noise-induced hearing loss caused by damaged or destroyed hair cells in the inner ear. Causes of mixed hearing loss vary wildly. Because there are a number of possible causes for conductive hearing loss, the source of the problem must be determined before a proper course of action can be taken. If the conductive hearing loss is the result of fluid in the ear (an ear infection) or a blockage, medicine may make a positive impact. Malformation of the outer ear, a tumor on the auditory nerve, a hole in the eardrum, or a hereditary disorder may be resolved through surgery. Medication or surgery may be the answer to conductive hearing loss, but it is possible that it may never be fully resolved. Regardless, mild to severe sensorineural hearing loss can be helped through the use of hearing aids; depending upon the severity of the conductive hearing loss, it may be enough to create a comfortable hearing solution for most people. If the mixed hearing loss is more severe, an implantable direct bone conduction system or a cochlear implant may be necessary for more normal total communication.